UNIVERSAL: Tired of holding your phone or straining your neck when watching videos on your smartphone? Worry no more because our phone holder offers to do that for you. 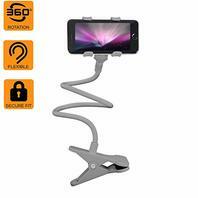 This phone mount can accommodate devices up to 5.7 inches wide. Perfect for your smartphone. EASY TO USE: You can clip this lazy phone holder to desk, tables, chairs, cubicle wall, cabinets, bed frames and so much more that your viewing option has no limit. Our iphone holder for desk features a sturdy ball joint that rotates on a 360-degrees angle attached to a flexible gooseneck clamp so you can easily adjust wherever you want your device to face. You can also use this phone clip horizontally or vertically depending on your preference. SAFE and COMFORTABLE: This iphone clip holder is heavy duty and has a firm grip for stable mounting to anywhere you can think of clipping its base. Guaranteed to be tight once clipped, this flexible phone holder also features a bendy arm that secure your smartphones without any vibrations preventing your device from falling or moving around. FREEDOM TO DO MORE: FREEDOM, oh yes you have that with this cell phone clip holder! You can do other things while still keeping your device perfect in angle. So, what are you waiting for get our desk phone stand now and enjoy the freedom that Audiology Connect gooseneck clam offers!